Chris Connolly, who has 5-3-8 in the past five games, was one of five Terriers to earn top performer recognition from Hockey East in its weekly release. The New York Times’ Jeff Klein commented on BU’s 6-on-3 advantage with the goalie pulled in the final minutes of regulation on Saturday and wondered if NHL teams might copy the strategy. The Islanders Outside Blog recapped the BU-Cornell game and looked closely at Isle’s draft choice Corey Trivino, who excelled on faceoffs. BU Today’s recap includes a slideshow and comments from Terrier fans at Madison Square Garden. Jason Lawrence who had been with the ECHL Charlotte Checkers, heads a bit further South, following a trade to the Georgia-based Gwinnett Gladiators. 2010 recruit Matt Nieto was profiled in a USA Hockey Magazine article, written before he committed to BU. Fellow recruit Yasin Cisse hit the 10-goal milestone in Saturday’s Des Moines 7-4 win over the NTDP U17s. He’s tied for 8th in goal scoring in the USHL, despite missing four games with an injury. 2011 recruit Alexx Privitera had an assist for Team USA. No, the headline isn’t a typo. In many ways, the outcome, a tie following a terrible first ten minutes, felt like a win—somewhat reminiscent of Harvard football’s memorable comeback tie against Yale in 1968 that resulted in the memorable headline (and later a movie): Harvard wins 29-29. The Terriers' bad-news start began with an early penalty, leading to a power play marker for Sean Whitney on a shot that flew past an out-of-position goalie Grant Rollheiser just 3:07 into the game. Cornell converted a breakaway just 2 ½ minutes later and had a 2-0 lead while BU was losing battles to loose pucks and being outhustled by the Big Red. Terriers began to turn things around halfway through the first period, but couldn’t put one past Cornell’s Ben Scrivens. In the second, frustration (at having two shots blocked) led to a bad penalty by Colby Cohen. David Warsofsky scored shorthanded to put BU on the scoreboard, but Cornell countered with a power play goal a second before the penalty ended. At that point—halfway through regulation, Cornell had three goals on just 11 shots. The Terriers held Cornell without a shot the rest of the period but continued to be denied by Scrivens. The game seemed destined by another one with BU outshooting an opponent, but on the short side of the scoring. The same song was playing as the third period got underway. Cornell had just two even-strength shots in the period, but no dice for BU, until Nick Bonino took advantage of a Cornell turnover and some puck luck to narrow the margin to one goal. For the next 15 minutes BU attacked without results, but with the goalie pulled BU turned a 6 on 4 advantage into the equalizer when Chris Connolly jabbed home a loose puck. A couple of sparkling Rollheiser saves—matched by Scrivins--kept things even in the extra session. ►The tie was only the second in the long history of BU-Cornell games with the first coming in the championship game of the 1966 Boston Arena Christmas Tournament—another come-from-behind BU effort. ► Bonino’s goal and assist extend to 39 (34-0-5) the streak of games that BU either won or tied when Bonino registers at least one point. ►BU outshot the Big Red 35-17 and, after a sluggish first period, finished virtually even in faceoff wins with Corey Trivino posting an 11-6 mark. • GoTerriers.com recap and photo gallery. • Audio comments from Coach Jack Parker, Connolly, and Shattenkirk. 2010 recruit Sahir Gill assisted on both Chicago goals in the Steel’s 3-2 loss to Green Bay. With 23 points, Gill is second in scoring for Chicago and tied for sixth in the USHL. Matt Gilroy's 4th NHL goal couldn't stop the Penguins from rattling the Rangers' cage, 8-3. The Terriers’ holiday week pair of non-conference games concludes with Saturday night’s reprise of Red Hot Hockey against Cornell at New York City’s Madison Square Garden. Two seasons ago, BU upended the Big Red 6-3 (video) at a sold out Garden. Seventh-ranked Cornell enters the game with a 5-2 mark and one of the nation’s top offenses, with a 4+ goals per game average and a strong power play. Terriers will look to duplicate the improved discipline they showed Tuesday against Harvard when BU took only three penalties, one of which was a coincidental one. The Big Red are led on offense by seniors Blake Gallagher and Colin Greening. BU's top line from Tuesday's win against Harvard remains intact. Chris Connolly, Nick Bonino and Joe Pereira produced four of BU's six goals against the Crimison. Alexx Chiasson returns as right wing on the third line after missing Tuesday's game with the flu. Sophomore Grant Rollheiser makes his third start of the season. He has a 1-0-1 record. Along with our usual list of game previews and links, check out the historical article, "BU in The Big Apple," written two years ago by contributor mh82 about BU’s past games in New York City, including games at previous Madison Square Gardens beginning in 1926. ▪ GoTerriers.com has links to game notes, live stats, the WWZN radio Webcast, and the video Webcast on All Access. ▪ Scott Weighart offers a feature piece on four Terriers from the greater New York City area who are looking forward to BU’s return to Madison Square Garden. ▪ Inside College Hockey’s pregame coverage looks at David Warsofsky’s move to forward for a few games this season. ►From the Maine Hockey Journal’s Nathan Fournier, we have a feature on women’s team sophomore defenseman Kasey Boucher, a Lewiston, Maine, native who recently returned home when the Terriers visited the Black Bears. Despite missing the season’s first four games and getting off to slow start, 2010 recruit Yasin Cissé is now tied for seventh in the USHL in goal scoring. His ninth goal, scored Thursday night in a 5-4 Des Moines’ loss to Omaha, ties him for the Bucs' team lead with Vermont recruit Conor Brickley. Freddy Meyer enjoyed his first two-point game of the season, assisting on the Islanders first and third goals in a 3-1 win against the Penguins. GoTerriers.com has invited "Burn The Boats" author Scott Weighart to share some of the details of the making of his chronicle of BU's 2008-09 seven-title season. A news release from the book's publisher, MosaicEye, details several holiday offers and book-signing events. USCHO's Hockey East columnist Dave Hendrickson explores the Terriers slow start to the season in his weekly column. Also, College Hockey News examines Kieran Millan's early-season struggles. Matt Gilroy who had drawn just one minor penalties in his first 23 games got a better look inside the penalty box following his first NHL fight in the Rangers' 2-1 shootout win over Florida. Gilroy picked up 17 minutes in penalties for the altercation. Chris Drury returned to the New York lineup and assisted on the Blueshirts' lone regulation goal. Ken Roche is third on the Charlotte Checkers in scoring with a 7-8-15 line in 13 games. Hockey on Campus, hosted by Bernie Corbett and Paul McNamara, will present a special 2-hour edition today from 1 pm to 3 pm ET in order to fit into the Thanksgiving Week schedules of many listeners. The show can be accessed live online , and will also be archived for access during long holiday weekend. 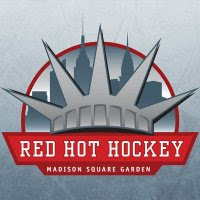 Terrier Coach Jack Parker (1:15 p.m.) and Cornell Coach Mike Schaefer (1:45 p.m.) will be on hand to chat about their upcoming weekend faceoff at Madison Square Garden in New York in the revival of “Red Hot Hockey. Also appearing will be Paul Kelly (2:30 pm. ), the newly named Executive Director of (the newly formed) College Hockey Inc.
► USCHO’s top-notch photographer, Melissa Wade, took a battery of great shots during last night’s win against Harvard. They’re located within the USCHO recap article. Shots 101 and 102 capture Chris Connolly’s game-winner in overtime. Audio of Jack Parker's post-game press conference after last night's win over the Harvard Crimson. Former Terrier Rick DiPietro, sidelined for virtually all of last season and all of the current year with injuries, has been practicing and discussed his return to the Islanders’ lineup. Does this sound familiar? An extra-attacker goal with 19 seconds left in regulation and then an overtime tally for a hard-earned come from behind win. No, not a reprise of the 2009 NCAA title game, but instead BU’s 6-5 OT win over Harvard tonight at the Bright Center. Sophomore Chris Connolly (photo), returned to the lineup following a shoulder injury notched the game-winner at 2:42 of the extra session. Senior Zach Cohen and junior Joe Pereira each scored twice with Cohen’s second tying the game in the final seconds. Nick Bonino more than doubled his season’s scoring total with a goal and three assists, including helpers on Cohen’s tying goal and Connolly’s winner. BU now is undefeated in the past 38 games when Bonino has scored at least one point, posting a 34-0-4 mark during the span. Four of Harvard’s five goals were scored by freshman Conor Morrison who had been recruited by the Terriers. -Just three penalties taken including one that was coincidental. -A 31-25 faceoff advantage with Corey Trivino winning 12 of 17 draws. -BU outshot Harvard 49-26 and scored three power play goals in five attempts. Earlier today we posted about Sahir Gill joining the 2010 recruit class. A month ago, we posted the Amateur Hockey Report feature on Gill and his decision to leave British Columbia and spend his senior year in the USHL with the Chicago Steel. Here is a link to that story. Thanks again to AHR’s Paul Shaheen. BU hopes to build off a good effort in Saturday’s tie with UNH when it makes the short trip to Harvard’s Bright Center tonight. The Terriers and Crimson will be playing the 141st game in a series that dates to 1922-23. Last season there was no pre-Thanksgiving matchup of the teams as they were scheduled to be opponents in the opening round of the Beanpot, which BU won, 4-3, on a Jason Lawrence slapper (video) with under two minutes left in regulation. GoTerriers.com has links to gamenotes, Live Stats, the WWZN radio Webcast and a pay-per-view Webcast from Harvard. Live in-game blog from GoTerriers.com. WTBU's Chris Aliano has written a feature piece on former BU goalie Brett Bennett, who after a year in the USHL, has returned to college hockey with Wisconsin. WTBU's game preview. Colin Wilson made his first start at Milwaukee where he was sent by Nashville after recovering from a groin injury. 2010 recruit Matt Nieto made The Hockey News' Hot List. BU’s already strong 2010 recruiting class got even stronger yesterday when Sahir Gill, a highly regarded forward playing for the USHL Chicago Steel, committed to the Terriers. The 5-10, 190 forward is a British Columbia native who grew up in Abbotsford, the same hometown as former BU standout David VanderGulik. USHR had recently reported that Gill, “a quick, skilled 5’10”, 180 lb. left shot forward,” had BU, Minnesota and North Dakota among his final picks. In 16 games for the Steel this season, Gill has 6 goals and 14 assists, seventh best in the league in scoring. Last year, Gill, considered a strong playmaker, played on the top line for the Vernon Vipers as a BCHL rookie, collecting 18 goals and 21 assists in 54 goals. He was a key contributor to the Vipers’ post-season run to the Canadian Jr. A RBC Cup title, adding another 10 goals and 12 assists in 22 games. Current freshman Ryan Santana was Gill's teammate on the Vipers' championship team. A ’92 birthdate, Gill previously played midget hockey for the Okanagan Hockey Academy posting a 43-56-99 line in 58 games. "Committing to a team like Boston University is very exciting," Gill told The Real Okanagan Hockey Academy Blog. "They have a great program there, and it was just the right fit for me. Playing in Hockey East is something I'm looking forward to, but my focus right now is on the Chicago Steel and working hard every game to help us have success." The Steel’s news release quotes Assistant Coach Jon Waibel, who says "the organization is very excited for Sahir. Boston University is not only getting a very skilled hockey player, but he succeeds in the classroom as well. He has been nothing but an asset to the organization since he joined us this summer, and he will do the same for Boston University when he arrives there next season." Gill is the fourth forward in the 2010 class, joining Charlie Coyle, Yasin Cisse (video), and Matt Nieto (video). The class also includes NTDP U-18 defenseman Adam Clendening. • GoTerriers.com recap and video highlights. • Boston Hockey Blog post-game comments from Saponari and Warsofsky. 2010 recruit Charlie Coyle had a hand in all four South Shore goals in the Kings' 4-1 win over Syracuse in ECHL play. Hescored shorthanded and on a power play and added a pair of assists, bringing his season totals to 10-26-36 in 21 games, third best in the league. Former Terrier co-captain John McCarthy scored his second goals of the season in the Worcester Sharks’ 3-2 win against Norfolk. McCarthy has 8 points on the season. Colin Wilson, who missed the past eight games with a groin injury, has been assigned by Nashville to its Milwaukee affiliate in the AHL. Terriers dropped the first game of its weekend pair with New Hampshire, 4-2, in Durham. Penalties and special teams play proved BU’s undoing as UNH scored two power play goals—one on a two-man advantage—while BU managed just four shots on goal in five power plays. The game marked the return of Alex Chiasson to the lineup and David Warsofsky's first full game at forward. Neither figured in the scoring. Goal scorers for BU were Zach Cohen, off a faceoff win by Corey Trivino, and Ross Gaudet, who converted a rebound of a Luke Popko shot. Cohen (photo) earned third-star honors. One silver lining for BU was improved faceoff results, winning 38 of 62 draws. The teams play again tonight at Agganis Arena. USCHO’s Scott Weighart, author of “Burn The Boats,” will be autographing copies of the book prior to the game and between the periods near the concession stand. Yasin Cisse’s goal-scoring streak reached four games –and 7 goals in the past 8 games—in Des Moines’ 6-4 win over Fargo on Thursday night. Cisse added an assist, bringing his season total to 8-2-10 in 12 games. After a slow start, 2011 recruit Cason Hohmann has adjusted to the speed of USHL play. The 5-7 playmaker who tallied just one assist in his first five games for Cedar Rapids, now has added 2 goals and 6 assists in the past 10 games. Terriers begin a crucial home-and-home series tonight against New Hampshire at the Whittemore Center in Durham. With Tuesday’s matchup against Harvard at the Bright Center, BU will play three games in five days heading into the holiday. Along with GoTerriers.com game notes, we have links to Live Stats, the UNH pay-per-view Webcast ($6.95) and the WZZN Radio Webcast which will be on delayed taped following the BU-Indiana basketball game. The Boston Hockey Blog will be live blogging throughout the game. 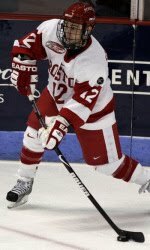 HockeyEastOnline.com reports that the January 8 BU-BC game at Fenway Park will be broadcast by NESN. ►Yahoo Sports offers a ranking of the top 10 hockey games of the past decade with the Terriers’ 4-3 overtime win over Miami in 2009 title game placing third. ►Former Boston and New York TV news sportscaster Len Berman’s new book, “The Greatest Moments in Sports,” picks the 1980 U.S. Olympic team’s “Miracle on Ice, ” that featured former Terriers Jim Craig, Mike Eruzione, Jack O'Callahan and Dave Silk, as the top American sports event of all time. Connolly joins the injury list--UPDATED. ► The Boston Hockey Blog reports that sophpomore forward Chris Connolly separated a shoulder and is questionable for this weekend’s games against. The Terriers had hoped to have a full complement of players available—except for Ryan Ruikka—with David Warsofsky’s return expected and Alex Chiasson’s a possibility. UPDATE: Following today's practice The Boston Hockey Blog reported Connolly skated briefly in a non-contact jersey. Colby Cohen left practice early following a lower-body injury not thought to be serious. Alex Chiasson returned to full contact drills. David Warsofsky spent the entire practice at forward, including some time on a line with Nick Bonino and Chiasson. ► The Bleacher Report looks at the defensive prospects in the Avalanche system, including juniors Kevin Shattenkirk and Colby Cohen. ► 20 games into the NTDP U18 schedule, 2010 recruit Matt Nieto is tied for second on the team in scoring with a 6-8-14 line. Defenseman Adam Clendening has picked up 8 points. On Sunday we reported Nieto's final-minute game-winning goal for the U18s to beat Green Bay. Here's a look at it, as Nieto, with a burst of speed, breaks in alone and beats the Gamblers' goalie. ►Due to their late birthdates, neither Nieto nor Clendening appears on NHL Central Scouting’s latest rankings of draft-eligible players. Yasin Cisse is rated #17 among USHL players. ► Tonight’s lineup of guests on Hockey on Campus Webcast includes two leading Western coaches, Michigan State’s Rick Comley and North Dakota’s Dave Hakstol. Also Vermont’s Justin Milo who spent last summer playing baseball in the Yankees’ farm system. He was profiled this week in New England Hockey Journal. With all the representatives of "green" schools on the program, will Bernie and Paul open the show with a song from Green Day? More coverage of Saturday’s 6-4 win against Merrimack in which Joe Pereira (photo) had assisted on the first and last goals and earned kudos for his effort from Coach Jack Parker. • The Boston Hockey Blog offers post-game comments from Nick Bonino, Chris Connolly and Kevin Shattenkirk. Dave Vander Gulik scorer his third goal of the season for Abbottsford, but Rockford, which got an assist from Pete MacArthur, beat the Heat, 6-3 in AHL play. Boomer Ewing, who had earned a spot on the Rockford roster, was sent to EHL/Toledo. Last season, with Wheeling, he was EHL Rookie of the Year. Kevin Schaeffer, who began the season with Coach David Quinn in Lake Erie, has been sent to ECHL/Charlotte where he joins former Terrier teammates Kenny Roche and Jason Lawrence. The Checkers fell to South Carolina in a shootout last night, 3-2, with Lawrence scoring Charlotte’s only shootout goal. Tom Morrow assisted on the game-winner for Kalamazoo in the Wings’ 3-2 win over Cincinnati . With Assistant Captain Nick Bonino returning to the lineup and Grant Rollheiser making his first start of the season, the Terriers turned up the offense to gain a weekend split with Merrimack, winning 6-4 at Agganis Arena. Bonino, who missed the past five games with a shoulder dislocation, registered his first two points of the season, assisting on the first of two Chris Connolly (photo) goals—a pretty pass on a 2 on 1 break—and on Colby Cohen’s power play bomb. Rollheiser stopped 25 shots and yielded just one even-strength goal. After Friday night’s distressing loss, the Terriers scored early and often. Captain Kevin Shattenkirk, who earned the game’s top star and now leads BU with 9 points, found the back of the net just 44 seconds into the game. The home team added three more in the opening period including the first career goals for sophomore Ross Gaudet and freshman blueliner Max Nicastro. 2010 recruit Matt Nieto scored the game winner with less than a minute left in regulation in the NTDP U18s' 4-3 win over Green Bay. Nieto, who also had an assist and earned the game’s #1 star, now has six points in his past four games. Another 2010 recruit, Yasin Cissé, scored his seventh goal of the season to bring the Des Moines Bucs even with Sioux City late in the their, but the Bucs would lose in a shootout, 4-3. In his past seven games, Cissé has six goals. BU scored first and last in North Andover last night, but Merrimack dominated in between those scores, with five consecutive goals, as they dumped the Terriers, 6-3, in a penalty-filled contest. Among the few bright spots for BU were the season’s first goals for sophomore Corey Trivino and freshman Wade Megan. Soph Vinny Saponari added his second, with all three BU goals coming on the power play. Adam Kraus relieved goalie Kieran Millan early in the third period and stopped 11 of 12 shots. BU’s losing streak hit four, the longest since January 2003. The teams complete the home-and-home series at Agganis Arena tonight. 2011 recruit Cason Hohmann scored his second goal of the season for Cedar Rapids in the Roughriders 4-3 shootout win over Sioux Falls. Hohmann, who also scored in the shootout, has six points in 12 USHL games. The injury-plagued Terriers are in North Andover tonight to take on the much improved Merrimack Warriors, the surprise team in Hockey East thus far. The Warriors have added some scoring punch to what may be the conference’s best one-two punch in goal with Joe Cannata and Andrew Braithwaite. Nick Bonino is still out of the lineup and will be joined on the sidelines by David Warsofsky and Alex Chiasson. That means Ben Rosen gets his second start of the year on defense after impressing his coaches with a strong effort last Friday against Northeaster. Wade Megan who performed well at center against Maine, will be at center again tonight. Kieran Millan will be in goal for the Terriers, but Grant Rollheiser will dress for the time this season. • From GoTerriers.com, links to game notes, game tracker, audio and pay-per-view video Webcasts. • USCHO's weekly Hockey East column and its preview of Merrimack. • In-game live blog from The Boston Hockey Blog. The Daily Free Press’s hockey notebook updates the growing Terrier injury list. Freshman Alex Chiasson took a hit in practice and is questionable for the weekend, while sophomore netminder Grant Rollheiser may finally be available for action this weekend against Merrimack and Nick Bonino's shoulder injury is improving. The weekly internet radio program didn’t air last night as Bernie Corbett handled the emcee duties at the Massachusetts Hockey Hall of Fame dinner. His and Paul McNamara’s guest tonight (7-9 p.m.) include UMass Amherst Coach --and former Terrier wing--Don "Toot" Cahoon, UNH women's coach Brian McCloskey, Bemidji State Coach Tom Serratore, CHN Editor Adam Wodon and Eliot Olshansky. Details. Kudos to former BU assistant captain Brian Strait, who notched his first professional goal last night in Wilkes Barre/Scranton’s 6-1 thumping of Portland. John Curry stopped 17 shots to pick up his seventh win in ten starts. Recap. Just back from the Four Nations tournament in Finland, 2010 recruit Charlie Coyle scored the only goal for the South Shore Kings in a 1-1 tie with the Junior Bruins. Coyle has 7 goals and 21 assists in 15 games for the Kings. Hockey On Campus airs its third program of the season tonight with guests including Scott Harlow, coach of the South Shore Kings’s whose forward Charlie Coyle returns to the lineup today after his European adventures in the Four Nations Tournament. The Boston Hockey Blog has posted Sunday’s post-game comments from Coach Jack Parker, goalie Kieran Millan and forward Chris Connolly. SouthCoastToday.com checks in on the pro career of Chris Bourque, traded earlier this season from Washington to Pittsburgh. Bourque has made 10 starts for the Pens. 2010 recruit Yasin Cisse got Des Moines off to a good start last night with his fifth goal of the season, but Chicago Steel rebounded for a 6-3 win, aided by two goals from Terrier recruiting target Sahir Gill, who ranks second in USHL scoring. 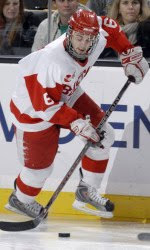 Winning one-goal games was standard operating procedure for the Terriers in 2008-2009, especially in the post-season when six of BU’s eight wins were single-goal victories. The pendulum has shifted thus far this season, as the Terriers were handed a third straight one-goal loss in a Sunday matinee, 3-2 by host Maine. BU regained the services of freshman Wade Megan and David Warsofsky, who missed Friday night’s contest, and the Terriers dominated shots on goal, 28-18, but couldn’t overcome a 3-1 deficit after two periods. 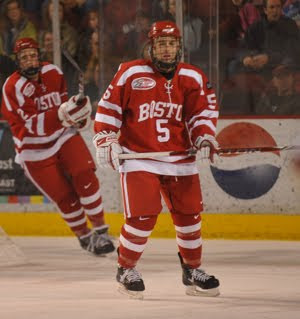 BU goals came from freshman Alex Chiasson (photo), who registered his team-leading fourth, and sophomore Chris Connolly. The loss was BU's first in a regular-season contest with Maine since January 2005. • Daily Free Press feature on scoring drought. Over the weekend, The Boston Herald offered features on BU’s top defensive pairing of Captain Kevin Shattenkirk and Colby Cohen, both high draft choices of the Colorado Avalanche, and on the string of injuries that have plague the Terriers in the early season. Former BU defenseman Joe DiPenta, who won a Stanley Cup in Anaheim before spending a season overseas in Sweden, has returned to North America. He signed a contract with Buffalo, was assigned to AHL Portland and has been describing his experiences in a series of blog posts for The Hockey News. 2010 recruit Charlie Coyle scored the game-winning goal for Team USA in Sunday’s Four Nation’s championship game, as the US topped Switzerland, 3-2. Coyle, who connected on a wrist shot from the high slot in the final seconds of the second period, had been added to the US NTDP U18 squad for this event played in Finland. Fellow 2010 recruit Matt Nieto, who had scored twice in Friday’s win over Sweden, added a pair of assists in Saturday’s 4-1 win against Finland. Nieto, who also had a goal in the pre-tourney exhibition game vs. Finland, finished as Team USA’s top scorer with a 2-2-4 line. The NTDP U 17s also played in a Four Nations Tournament, this one in Slovakia, and had similar success, sweeping games with Russia, Switzerland and the host team. 2011 recruit Alexx Privitera picked up a pair of assists in the three games. Another 2011 recruit, forward Cason Hohmann registered his third assist of the season for Cedar Rapids in its 6-3 loss to Green Bay. • Thanks to one of our readers who forwarded this video of 2010 recruit Yasin Cissé’s recent hattrick for the Des Moines Bucs. After dropping a hard played contest Friday night at Northeastern's Matthews Arena, the Terriers travel to Alfond Arena to take on the Maine Black Bears this afternoon at 4 pm. Maine will try to win their second game in a row while BU will try and prevent back-to-back losses from turning into a losing streak. Both teams have struggled out of the gate and are looking for their second win in Hockey East play. BU took last year's season series between the two teams by beating Maine twice in the regular season and coming back to tie in the final regular season matchup. The two teams met in the Hockey East Quarterfinals at Agganis Arena, with Maine outplaying BU in the first two games, but the Terriers managed a split. In the final game BU took it to the Bears by a score of 6-2. Sophomore Gustav Nyquist leads the Black Bears with 11 points (4G, 7A) in 7 games played. We have a preview from GoTerriers.com, including links to game notes, GameTracker, and WWZN's radio broadcast. Also, All-Access video coverage provided by the University of Maine is available (monthly pass). The DFP will again be blogging live on their Boston Hockey Blog. Also, Nathan Fournier the Maine Hockey Journal will be covering the game live as well beginning at 3 pm with a live blog. The injury depleted Terriers produced perhaps their best effort of the season last night, but came out on the short end of a 1-0 score, primarily due to the standout netminding of Northeastern freshman Chris Rawlings, who turned away all 43 shots. The game was scoreless until midway in the third period when Wade MacLeod scored a minute into a power play, following a controversial call. BU played a strong game on defense, holding the Huskies to just six shots from within 10 feet of the BU cage and pleasing Coach Jack Parker. BU also turned around the negative numbers on faceoffs from previous games, winning 39 of 69 draws. Next up is another road game, against Maine on Sunday. BU heads across town to its original home rink, Boston Arena, now renamed Matthews Arena—which was renovated again this past summer—to take on Northeastern. The two teams battled last year for the regular season Hockey East title with the Terriers overtaking the Huskies on the final weekend for a one-point margin. Like BU, Northeastern had substantial personnel losses to graduation and early departure, including HE POTY Brad Thiessen, top forwards Joe Vitale and Ryan Ginand, defensemen Louis Liotti, Dennis McCauley and Dan Nycholat. The Huskies, with a 2-3 record like BU, are previewed by USCHO’s Dave Hendrickson. The teams played four times last season with BU winning twice, including the Beanpot championship game, followed by a pair of back-to-back ties in late February. Tonight's game is the 203rd meeting in the series, with BU holding a 144-50-8 edge. The first game between the teams was played, appropriately enough, on the first Monday of February in 1931 as part of the tryouts for the 1932 U.S. Olympic team. BU won, 4-3. From GoTerriers.com, links to game notes, the online radio broadcast on WWZN, and a pay-per-view Webcast ($8.95) on GoNU.TV. The Daily Free Press previews tonight’s game, noting the sophomore defenseman David Warsofsky remains doubtful due to an injury. The DFP will be live blogging during the game at its Boston Hockey Blog site. USCHO’s weekly Hockey East column. Looking back—Two Terriers and a River Hawk. The AHL Web site has a feature on former rivals Brandon Yip and Justin Mercier, now teammates and roommates on the Lake Erie Monsters, coached by former BU Associate Head Coach David Quinn. USCHO has posted an excerpt from "Burn The Boats." Scott Weighart's chronicle of the 2008-09 BU season. Team USA beat Sweden, 4-2, in the first round of the Four Nations Tournament today, taking on Sweden. USA Hockey link. 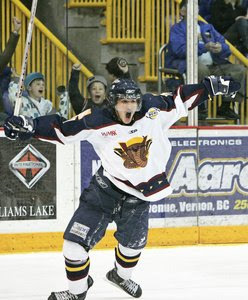 2010 recruit Matt Nieto scored the first and last goals for the U18s, while fellow recruit Adam Clendening added an assist. The Daily Free Press's Boston Hockey Blog reports that sophomore defenseman David Warsofsky, Hockey East's Player of the Week, is likely to miss Friday's contest at Northeastern due to an injured adductor muscle. The post also provides injury updates on Nick Bonino and Grant Rollheiser. A feature on theahl.com reveals that Brandon Yip and former Miami forward Justin Mercier, rivals last Spring's NCAA title game, have become roommates while playing for the Lake Erie Monsters, the Avalanche affiliate coached by David Quinn. Team USA dropped a 3-2 decision to host Finland in an exhibition game prior to Friday's kickoff of the Four Nations tournament. 2010 recruit Adam Clendening helped the Americans to an early lead when the rebound of his shot was converted by BC recruit Bill Arnold. After the Finns scored, USA regained the lead on a wrist shot by 2010 recruit Matt Nieto. But the hosts evened the score and collected the game-winner in the final period. EJHL forward and 2010 BU recruit Charlie Coyle did not figure in the scoring. This week on Hockey on Campus, which airs online tonight between 7 and 10 p.m. ET, Bernie Corbett and Paul McNamara’s guests include UMass Lowell coach Blaise McDonald, Miami’s Enrico Blasi and our colleague Adam Wodon, editor of College Hockey News. Earlier this year, we offered a post on BU’s renowned strength and conditioning coach Mike Boyle, noting that his presence and recognized achievement are among the reasons recruits make BU their college choice. Current freshman Alex Chiasson is an example, having told NHL.com ““Mike Boyle is there and he's known around the world for what he's done with hockey players." In the following Q&A, posted with permission from New England Hockey Journal, Boyle shares some of the expertise that has made him a recognized thought leader in sports conditioning. It originally appeared in the publication’s October 2009 print edition. Michael Boyle is one of the world’s foremost educators in the areas of performance training, personal training and athletic rehabilitation, with a client list that reads like a “Who’s Who” of athletic success, both in New England and across the country. Boyle has been involved in training and rehabilitation with a wide range of athletes, from stars in every major professional sport, to the U.S. Olympic women’s teams in soccer and ice hockey. In addition Mike has served as a consultant to some of the top teams in the NFL and NHL, as well as numerous Division 1 colleges, and has spent two decades on the staff at Boston University. In 2007 and 2008, “Men’s Health” magazine named his Massachusetts facility, Mike Boyle Strength and Conditioning, one of the top workout facilities in the U.S.
Boyle’s impact is now being felt globally through his Web site, www.strengthcoach.com, a top source of performance enhancement, and through the translation of his book, “Functional Training for Sports,” into Japanese, Chinese and German. Q--What are the first things you tell a young player who’s new to your training program? A--It depends on the player’s age. For young players we tell them it is about how they do things, not how much they lift. Young kids are often in the ego stage of, “How much can you bench press?” We need them to understand that they wear the skates on their feet and that lower body is where it’s at. Q--If you had a list of a few top exercises to help young players improve their conditioning and injury prevention, what would they be? Q--What’s one aspect of a strength and conditioning regimen that’s too often overlooked by hockey players? A--What is often overlooked is lower-body training. It is amazing how many kids will lift on an upper body-only type program and tell you that skating is enough for their legs. Nothing could be further from the truth. Q--What are the biggest changes in your field over the last five years? A--The biggest changes in the past five years have been negative. Kids play all summer instead of training. The tournament organizers are getting rich and the players are getting worse. USA Hockey has recognized this and is trying to implement a new Development Model to try to get the horse in front of the cart again. Five years ago we had most of the best young talent in Massachusetts on a training program. Now most of them are on the tournament circuit. There are no Mass. players going to the National Team Development Program this year. To me, that shows that we are failing to develop players with the current games-oriented approach. Q--How much of a factor is fatigue in the third period and what can be done to combat it? A--I think fatigue is a huge factor and it goes back to what we talked about above. Players who don’t train or have a structured offseason will have difficulty improving their conditioning. You need to push the body in training to improve conditioning. Q--What are some of the best cool-down tips you can give players? A--The best cool-down tip is actually a nutrition tip. Drink a high protein/high carbohydrate shake after every practice or game. There is no better time to get nutrients back in the body than right after a game or practice. We are fanatical about shakes with our BU players. Chocolate milk is a great simple post-game or post-practice drink. Q--Nutritionally speaking, what do you recommend before or after games for players on the go? A--For after, see above. For before, concentrate on food. Food does not come in a box or in a wrapper. The longer the ingredient list, the worse the food. Ask yourself when you eat, “Is it food?” Fast food is the lowest form of food. Avoid it whenever possible. Q--What do you work on with players to increase their recovery time between games? A--We have a set post-game routine. We ride a stationary bike for 6-8 minutes, foam roll to self-massage sore and tired muscles, and then we stretch and drink a shake. You can buy a 12-inch foam roller and keep it in your hockey bag. Q--You’ve spent 21 years at BU. What was the most satisfying part of last year’s championship? A--I think having my 10-year-old daughter with me the whole time. She got to see the games, be on the ice during the celebration and be in the team picture that you see everywhere. She’s the little girl in the right corner in the red jersey. When we won in 1995 I was relieved because it was our third final game of the ‘90’s. 2009 was special because we hadn’t been to a Frozen Four in a long time. It was also special because we had players like Jason Lawrence (Saugus, Mass) and John McCarthy (Andover, Mass.) on the team that I had known since elementary school. The Daily Free Press offers two articles this morning, one overviewing the weekend split with UMass Lowell and another examining BU’s ongoing struggle on faceoffs. WTBU provides its own recap of the Halloween contest with Lowell. The split sent the Terriers tumbling to 10th in the INCH power rankings. In the USCHO poll, BU is now ranked seventh. 2010 recruit Charlie Coyle, off to a blazing start with EJHL South Shore Kings, has been added to the NTDP U18s roster for the Four Nations’ Tournament this week in Finland. At the tourney, he’ll get early opportunity to skate with future teammates Adam Clendening and Matt Nieto. USA Hockey news release. Last summer, Coyle donned the USA sweater as part of the US Select U18 squad at the Ivan Hlinka Memorial Tournament in Slovakia. There, he scored twice in three games including a penalty-shot game-winner vs. Finland. Earlier this season, Coyle received an "A" rating from NHL Central Scouting in its listing of "players to watch" for the 2010 draft. Looking back NHL.com examines some of the ups and downs in Predators' forward Colin Wilson's first season in the NHL. The Terriers’ two-game winning streak was halted as UMass-Lowell reversed Friday night’s verdict with a 3-2 win at Agganis Arena. BU took three first-period penalties and paid the price as the River Hawks took a 1-0 lead into the second period. BU tied the score on Vinny Saponari’s (photo) first goal of the season, a second after a power play ended. Lowell answered a minute later, then stretched the lead to two before Captain Kevin Shattenkirk’s power play blast made it 3-2 Lowell, the same score after two as on Friday night. GoTerriers.com recap. USCHO recap. Comprehensive boxscore. Coach Parker text comments, as well as audio. Shattenkirk & Eric Gryba post-game comments. Video highlights. Check back for more coverage. 2010 recruit Yasin Cissè scored his first USHL hattrick in Des Moines’ 5-2 win against Green Bay. The 6-3, 208 winger from Quebec scored a power play goal, an unassisted goal and an empty-netter.